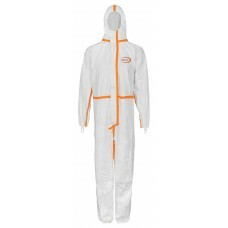 DACH coveralls are produced according to the directive 89/686/EEC on personal protective equipment. They have a generous cut and ensure a good freedom of movement. The correct choice of appropriate overalls is always combined with a careful analysis of the respective workplace. Before using the coveralls you should always check the intended purpose, the used hazardous substances and the duration of work. We ensure the right level of protection with quality suits from DACH own production.